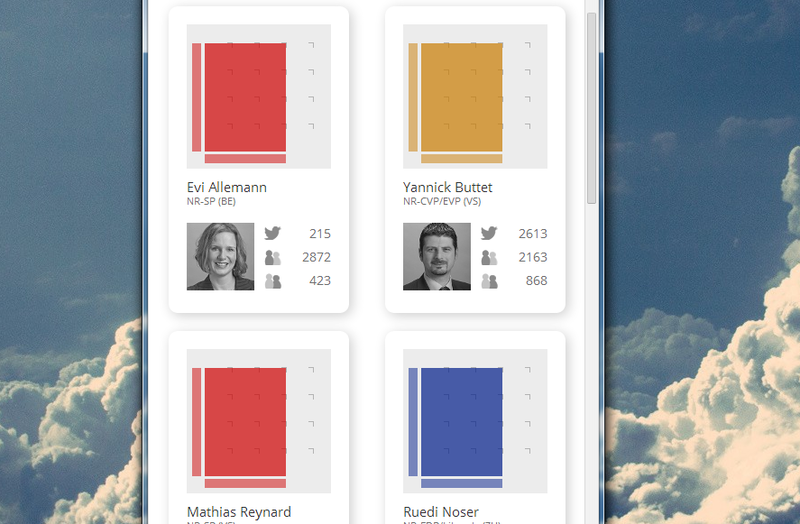 Together with my friends from the SoMePolis project, I drafted, designed and implemented an interactive application which allows to monitor and analyze the Twitter accounts of Swiss parliament members. This blog post sums up pretty well what is possible with the app — unfortunately it’s written in German. In short, the app allows the user to rank parliament members based on their activity and interactivity on Twitter — two concepts which were operationalized with key figures such as the number of Tweets within a timespan and the number of interactions with other users. The goal was to provide a simple yet transparent and not too complex measure of how politicians perform on Twitter, i.e., exactly the opposite of what other services such as Klout provide — nontransparent, proprietary ranking algorithms. The user interface supports common interactions such as sorting, filtering and searching, and all these actions automatically trigger a dynamic update of the visible data set. The user interface allows for sorting, filtering and searching. One thing that I am quite proud of is the responsiveness of the app. This was not implemented with the help of a common framework such as Bootstrap.js and thus does not rely on CSS media queries (but probably could have). In fact, the window size is extracted and, based on this information, the corresponding data items are arranged dynamically. Naturally, each resize of the window triggers a re-arrangement if needed (try it out by resizing your browser window). The arrangement of the data items is dynamically changed based on the window size and thus based on the type of device. I again implemented this visualization with D3. In this case, it was particularly helpful for data filtering and sorting, but also for the animations that happen on page change and window resize.